Smooth cheese and piquant flavor. 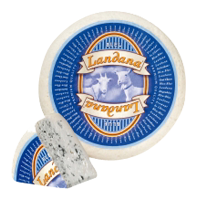 The Landana blue cheese is of course also available as goat cheese. Mild goat cheese with piquant Dutch blue veining is a treat for the taste buds. What’s more, this goat cheese is also organic.